Greenwich Village Habitué has two fully appointed private apartments available in an owner occupied 1830's Federal brownstone building in the historic West Village and Gansevoort Market Meatpacking District of New York City. The extremely popular HighLine Park and the new Whitney Museum for American Art are both located one short block away. 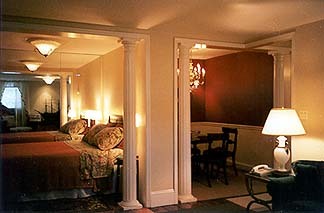 A 5 night minimum stay is required - single or double occupancy only. Whether you are traveling to New York for business or pleasure, you will find that our home offers a high degree of comfort, privacy and friendly service in an environment that reflects the quiet elegance of an earlier time. 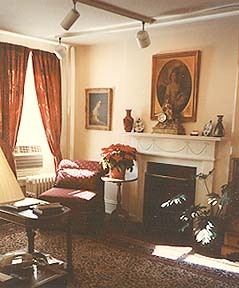 As quoted by Mimi Reed of Food and Wine magazine:	"It was to our delight, an immaculate, graciously stocked and elegantly furnished apartment in a brownstone. It seemed a great bargain." 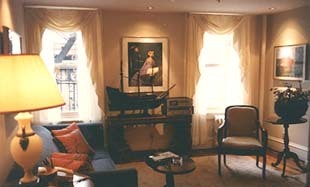 Greenwich Village Habitué welcomes both business travelers and seasonal visitors for both short term and long term stays and attracts sophisticated, well-travelled persons. Antique filled apartments come complete with living room, dining alcove, sleeping alcove with queen size bed, full bath and small service kitchen suitable for preparing a light breakfast ONLY - no cooking please. There is a coffee maker, toaster, small refrigerator and a microwave. 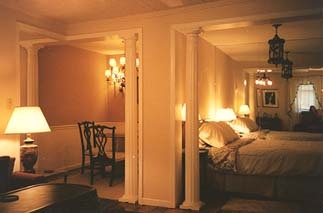 They are finely appointed sanctuaries of privacy that combine time-tested standards with modern conveniences. Greenwich Village Habitué is nestled between what could be considered two of the largest cities in the United States - Midtown/Times Square and the Wall Street/Financial areas - conveniently located in Greenwich Village and the "relentlessly hip" Meatpacking District, with easy access to all Manhattan has to offer. 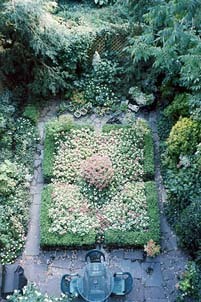 The apartments overlook a formal English garden. Note: Guests do not have access to the garden. Greenwich Village is undoubtedly one of New York's best known neighborhoods. Its very mention evokes an assortment of familiar images - the cultural underground of bohemians and beatniks; the booming art scene; the stately world of Henry James' Washington Square; shopping for the latest fashions in the Meatpacking District and on nearby Bleecker Street. The area contains an abundance of restaurants, theaters, clubs and shops, as well as some of New York's oldest and most charming residential blocks. In fact, many of the area's quiet, narrow streets -- virtually unchanged since the early 1800s -- have a refreshing smallness of scale. The streets themselves are a crazy quilt of diagonals and curves that mostly pre-date the rigid grid pattern of the north. The neighborhood is a gold mine of social and cultural history. But whether one comes to savor the architecture, immerse oneself in its history, enjoy the nightlife, restaurants and shops, or just take a lazy stroll through this peaceful downtown enclave, the Village offers a multitude of pleasures. 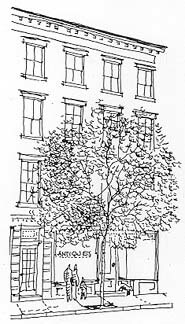 In short, Greenwich Village and Greenwich Village	Habitue has it all -- history and timelessness, along with all of the modern diversions and amenities that the savvy, well-seasoned visitor to New York demands. We are strictly a NON-SMOKING establishment. Daily maid service is NOT provided. Guests are asked to tidy up after themselves. Apartments are provided with complimentary Wi-Fi, air conditioning, television, stereo, and telephone for local calls only. Long distance calls can be charged to your phone card. Check-in is after 3:00 p.m. and before 8:00 p.m. Please note: We require our guests to notify us either by email or by telephone, with their approximate time of arrival at least one week prior to their scheduled arrival date. Payment MUST be made in cash, travelers checks or Official Bank Checks. Rates are $175 per night plus tax for a total of $202 per night (single or double occupancy ONLY) and are subject to change. Minimum age for our guests is 18 years. Appropriate facilities for pets are NOT available. Reservations MUST be made in advance and finalized by either emailing us at gvhabitue@aol.com or by calling us at (212) 243-6495. A deposit equal to 25% of your stay may be required to confirm a reservation. Payment is due in full upon arrival and constitutes your understanding of our policies and operating procedures and, most importantly, your agreement to abide by them. No refunds or adjustments after arrival. If a deposit is required it will be returned providing we are notified 21 days prior to your scheduled arrived date. Stays of 7 days or longer MUST be cancelled at least 30 days prior to your scheduled arrival date.